Are you feeling intimidated and overwhelmed by the thought of starting seeds indoors, or unsure of how to get started? I’ve been there, and I know exactly how you feel! It’s tough to get started when you’re overwhelmed thinking about everything that goes into growing seeds indoors, and caring for the seedlings. I know what it’s like to put all that hard work (and money!) into starting seeds indoors, only to watch your prized seedlings wither and die. Or feeling like a failure because everyone else makes it sound like it’s super easy to start plants from seed, but you haven’t mastered that skill yet. Over the years, I’ve grown most of my vegetables and annuals, and many of my perennials from seed. In fact, I hardly ever buy seedlings at the garden center anymore. I’ve mastered the art of starting seeds indoors, and you can too! Now I’ve taken my knowledge about starting seeds indoors, and broken it all down to make it easy for anyone to start their own seeds indoors and grow strong, healthy seedlings that will survive being transplanted into the garden. 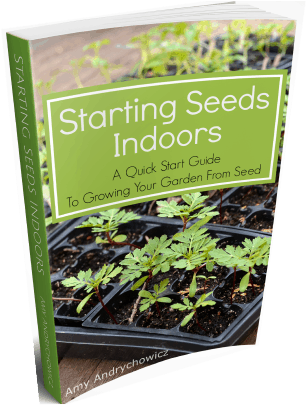 So, if you’re stuck because you can’t find straight answers to help you successfully start your seeds indoors, and you’re tired of wasting your time and money with no success – then this eBook is for you! Stop wasting your time and money, and take the guess work out of starting seeds indoors! For less than the cost of a few packets of seeds, this quick-start guide will get you up and running in no time! Get started growing seeds indoors today!